We've had some pretty diverse groups visit the museum. 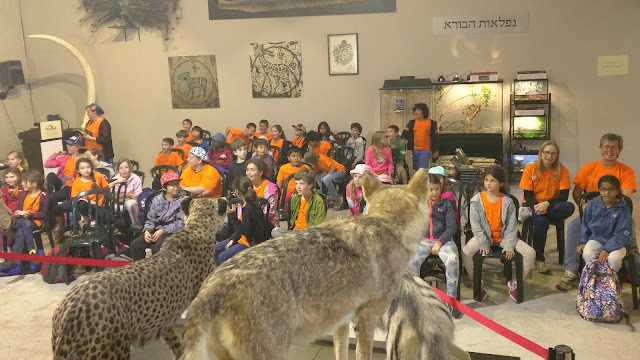 For example, last week, we had one tour which combined two groups from Monsey - a group of Chassidishe yeshivah students, and a group of Christian African-American girls from a Ramapo high school on an exchange program. That made for a pretty interesting combination! We've also had groups of Bible scholars from Ireland, Nigeria, and Tibet. But today's group was perhaps our most fascinating group yet. 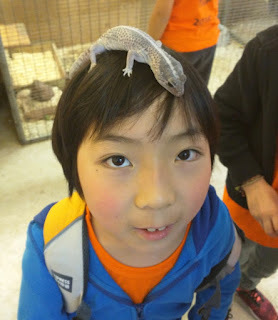 It was forty-two elementary school children from the Anglican International School Jerusalem. This is a multinational school that has many children from families of diplomats and other foreigners temporarily living in Israel. The language of instruction is English, and so, for a change, I led the tour myself instead of having one of our usual children's guides. One of the themes of the museum is about how the animals of the Bible are, generally speaking, the animals that lived in the region of Biblical Israel, which are different from the animals that live in other places. As a prelude to this discussion, I noted that the children present were from many different countries, and I turned to each of them to ask them which country they are from. "Italy!" I repeated through the microphone. I pointed to the next child. "And where are you from?" I didn't know if he meant Ramallah, East Jerusalem, or Jaffa, but I didn't ask. There were some memorable moments on the tour. When the children saw the taxidermy displays, I explained that these animals were not killed for the museum, but rather they died in zoos and were subsequently stuffed. One child asked: "Wouldn't it be more respectful to cremate them?" Later, a ten-year-old boy asked me my name. He hesitated. "That's really hard to remember," he said. "Can I call you Jim instead?" And so for the next hour, whenever this boy wanted to ask me something (which was quite often), he would frantically wave his hand and call, "Jim! Jim!" All forty-two of the children were incredibly well behaved. The difference between them and a certain ultra-religious school that visited yesterday was astonishing. They were so polite and respectful! My staff had never seen anything like it. My only regret is that my administrator is not a Star Trek fan, and thus did not take advantage of the opportunity to say to me, "It's life, Jim, but not as we know it." Unlike in Star Trek, this "Jim" is a doctor, dammit! 'embiggen' in the photo caption instead of 'enlarge'? Are you trying to imitate Trump's 'bigly' use instead of 'hugely'? Embiggen is a perfectly cromulent word. Well behaved except for the Jim part. Why couldn't he have called you simply "Rabbi"? Anyways, thanks for the post, as always. Our cousin teaches in that school. I will send this to her! I believe it is right up your ally. I imagine diplomats' kids would know how to behave. That's the diplomat's job. Behave in all circumstances. For the record, many Jews, particularly girls, went there about a hundred years ago when it was one of the only games in town. Your almost choking upon hearing the "P" word reflects healthy instincts. And may the day soon come when we can be proud of how overwhelmingly polite students are from the Torah sectors. How did you deal with the issue of teaching Torah to gentiles? This Yeshivah Gets It Right!